Won't You Be My Nabor: In the market, looking to buy . . . anyone have an FYI? In the market, looking to buy . . . anyone have an FYI? Okay, so Mike and I are in the market for a new bed. Now that we have a larger bedroom we have decided that we are going to put our Queen slay bed in the guest room and then get a King. I know what I want - but having a little trouble finding it. I want a wood, canopy bed, basic with nice lines.I don't want anything elaborate because I want to have a bed that will not go out of style and be something that can grow with me and my style (which when it comes to decorating, changes often.) I have looked around Memphis/MS where we live and have found 2 that I am considering, but they still are not quite what I am looking for. I got my sleigh bed when I graduated high school in AR at Dennis Home Furnishings (Dennis Young - a good friend from high school and his family own the store.) I've thought I should talk to him and see if he has what I am looking for - if so, I would make a trip down there. In the mean time - if anyone knows of a furniture store that has this, please let me know!!! I know somewhere out there must have just what I want. 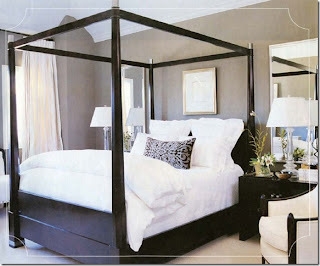 I always like things that are different, and as I said before I do not want anything that is extravagant when it comes to the design, but something along the lines of a basic canopy bed, or something like that with a little bit of a unique design to it would be nice too. I have looked through magazines and on-line and have saved a few pictures of what I am looking for . . . this first one is what I really want.